Football - Mixenden v Midgley United. Cameron Tait for Mixenden and Jason Cartlidge for Midgley. Calder ‘76 moved back into a six point lead at the top of the Haslem-Sheppard Halifax AFL with a 4-0 home success over winless Holmfield. Remi Allen opened the scoring but Holmfield hit the bar and the post before a great cross from Jonny Gibson was met with a diving header form Ricky Topham to make it 2-0 after 20 minutes. That deflated the visitors somewhat and Steve Jones played a one-two with Topham to make it 3-0 early in the second-half before Gibson completed the rout. Calder missed further chances and were able to give run-outs to Nathan Dempsey and Callum Wheelwright who caught the boss’s eye. After another period of inactivity, Warley Rangers were delighted to edge out bogey side Copley United 4-3 at Shroggs Park. A make-shift Rangers side dominated the first period and led at half-time thanks to Tom Hiley’s volley. Minutes into the second-half Gary Ash fired in his seventh of the season from 20 yards to level and it stayed 1-1 until the final 20 minutes. Copley substitute Lee Worrall scored with his first touch before Warley scored three goals in eight minutes to turn the game on its head. Dan Kirman hauled them level with a bullet header from Reece Brady’s cross before Carlton Balmer took advantage of a defensive mix-up to beat the keeper from a tight angle. Hiley burst away and fired in his second to seal victory but there was still time for Copley to make it a tense finish as Worrall fired through a crowd of players. Ryburn United kept up the pressure on leaders Calder with a 3-0 away win over lowly Greetland AFC. All three goals came in the second-half with Christian Silkstone netting his 11th of the campaign and Joseph Swallow firing in his first two goals of the season. Ryburn moved back up to second with a game in hand on Calder. Mixenden United had a game abandoned for the second time this season, this time at home to Midgley United who led 2-1 after 72 minutes. Adam Gaze scored for the hosts, while Tom Booth was on target for Midgley with the game poised at 1-1 heading into the final 20 minutes. Rob Stansfield’s goal for the visitors then sparked outrage that eventually led to the abandonment of the game. Shelf United were held 2-2 by visiting derby rivals Northowram in their first match for almost three months. The Rams, who had the benefit of one outing in January, shot into a 2-0 lead up the slope at Shelf Park through Carl Smith and Mark Eade. A Jon Lister header from a Billy Grogan cross halved the deficit before the break and after Elliott Parkinson had levelled things up the hosts hit the woodwork twice late on. Sowerby Bridge ended their four game losing run with an emphatic 6-3 away win at AFC Crossleys in Division One. Kris Charnock (2), Joel Cleary, Adam Fenton, Jake Tait and Jordan Bedford - with his eighth of the campaign - were all on target for Bridge, who remain eighth. AFC Crossleys responded through Craig Gladwin and Andrew Brunning (2), who extended his impressive seasonal tally to 17. Elland United made it back-to-back wins with an emphatic 7-2 home triumph over Halifax Irish Centre. Mark Kelsey scored four times while Jake Bradbury (2) and Thomas Hall were also on target for the hosts who move up to fifth. Halifax Irish Centre remain rooted to the foot of the division, goals from Steven Mitchell and Jonathan Whiteoak offering little consolation. Illingworth St Marys maintained their 100 per cent record with a 9-1 rout of Elland Allstars. The returning John Booth stole the show with eight goals to extend his season tally to 39. His first came after an even first 10 minutes as an Elland defender tried to pass back to his keeper, only for Booth to get there first. It was one-way traffic from then on as some slick passing kept opening up the Elland defence with Booth scoring three of his goals in around 90 seconds. Phil Livsey was also on target for the hosts who are now nine points clear of nearest challengers Brighouse Sports AFC. Connor Bell prevented a whitewash for Elland Allstars, who remain fourth. Brighouse Sports won 2-0 away to Midgley United Reserves. Top-scorer Chris Allan scored both goals for the visitors. Ryburn United Reserves’ fixture against Sowerby United was the second AFL game to be abandoned with the score at 0-0 after 33 minutes. Denholme United cruised to a 6-0 away thrashing of Salem in their first game since mid-November. Ben Burkill (2), Jack Harrison (2), Daniel Moralee and Matt Waring condemned Salem to a 10th league defeat in a row. 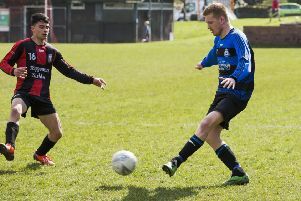 St Columba’s stretched their lead at the top of Division Two to 11 points by beating Shelf United Reserves for the second time in eight days. Saints took an early lead when Jack Wilkinson’s first time strike from just inside the area found its way past the Shelf goalkeeper. It took until midway through the second-half for them to extend their lead, with skipper Ryan O’Neill smashing home after good build up work down the right from Kitubo Touray. Saints were rarely troubled but had a scare when goalkeeper Macualey Richardson made a smart save and the rebound was cleared off the line by centre back Jack Dobson. Barry Richardson again made a strong impact from the bench, extending Saints lead with great finish from a tight angle before leading scorer Frank Odion cashed in on good work from Touray to complete the scoring. Hebden Royd Red Star Reserves beat Salem Reserves 4-3 with goals from James Cowens, Lewis Cockroft and Rob Laycock (2). Salem Reserves found the net through Martin Jenkins, Jay Thomas and Luke Hegarty. Shelf FC closed the gap on Greetland AFC Reserves in the third versus fourth clash with a 2-1 home victory. The hosts went 2-0 up thanks to goals from James Grace and Gary Boldy before Mark Hindle pulled one back. Sowerby Bridge Reserves cruised to an 8-0 victory over AFC Crossley Reserves thanks to Aiden Kershaw (2), Neil Davies, Stewart White and four from top-scorer Keelan Noble. Northowram Reserves recorded an impressive 6-1 away win at Sowerby United Reserves to open up a nine point gap between the sides. Fifth-placed Northowram scored through Ashley Ackroyd, Liam Smith, Chris Gent, Paul Greenwood and top-scorer Matt Calland (2) for their seventh win of the season. Rory Thickett scored Sowerby’s solitary goal.